HomeCare & Hospice of the Valley is dedicated to providing compassionate and dignified home health, palliative, and end-of-life care to all patients and their families. We provide five core areas of service to patients and their families who reside in any of the local communities in the three-county region of Eagle, Garfield and Pitkin Counties. We work with all insurances to obtain as much coverage as possible for the services needed, and help find solutions for patients who cannot pay due to lack of insurance, income or for other extenuating circumstances. Our Home Health Services provide a wide range of health care services that can be given in the home for an illness or injury. Home health care is usually less expensive, more convenient, and just as effective as the care received in a hospital or skilled nursing facility. Private Pay Services offer private duty nursing by certified nursing aides or personal care assistants. Care provided is a 2-hour minimum to 24 hours/day, 7 days/week. Our Palliative Care Services provide relief from the symptoms and stress of a life-threatening illness that has not yet advanced to the point of needing hospice care. Hospice Services provide care to individuals who are diagnosed with a life-limiting illness and have a prognosis of six months or less to live, as well as support to the patient’s family and friends. Our Grief and Bereavement Services are designed to respond specifically to the needs of individuals and families who are coping with death, loss and grief. 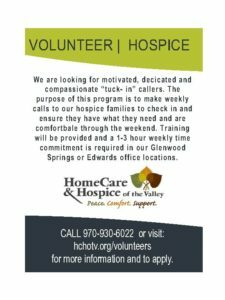 HomeCare & Hospice of the Valley is a 501(c)3 nonprofit corporation. We will work with all insurances to obtain as much coverage as possible for our services. We are committed to serving patients regardless of their insurance. We are the only locally owned non-profit provider of HomeCare and Hospice services. Help us launch this new program that will wrap our patients with an extra layer of support! We welcome and appreciate your donations to support our many programs and services.